Synovial joints are highly innervated but vascularized indirectly by nearby tissues. Although the articular capsule is innervated with the nerves necessary for movement, it lacks blood vessels because the arteries wrap around the joint in an anastomosis, bypassing direct capillary contact with the capsule. The articular and epiphyseal branches given off by the neighboring arteries form a periarticular arterial plexus. Exchange of gases (oxygen and carbon dioxide) and nutrients is achieved, albeit slowly, via diffusion or more efficiently during exercise via convection. convection: The movement of groups of molecules within fluids such as liquids or gases. osteomyelitis: An infection of the bone and bone marrow characterized by inflammation. anastomosis: A cross-connection between two blood vessels. Elbow Joint: Diagram of the anastomosis around the elbow joint. The blood supply of a synovial joint comes from the arteries sharing in anastomosis around the joint. 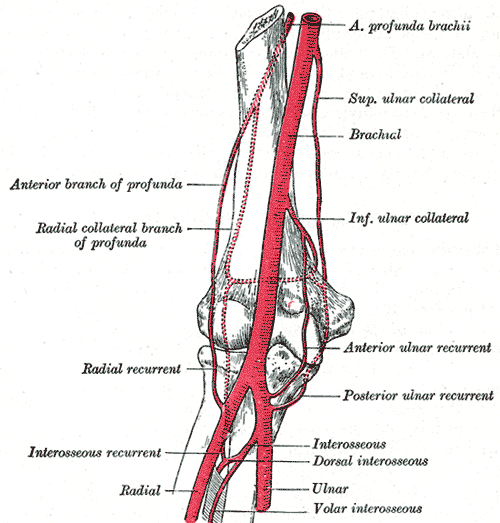 The articular and epiphyseal branches of the neighboring arteries form a periarticular arterial plexus. The articular capsule is highly innervated but avascular (lacking blood and lymph vessels), and receives nutrition from the surrounding blood supply via either the slow process of diffusion or convection, a far more efficient process. Numerous vessels from this plexus pierce the fibrous capsule and form a rich vascular plexus in the deeper part of the synovial membrane. The blood vessels of the synovial membrane terminate around the articular margins in a fringe of looped anastomoses termed the circulus vasculosus (circulus articularis vasculosus). It supplies the capsule, synovial membrane, and the epiphyses. After epiphyseal fusion in the growth of long bones, communication between the circulosus vasculosus and the end arteries of the metaphysis is established. This minimizes the chances of osteomyelitis in the metaphysis. The synovial cartilage in the capsule acts somewhat like a sponge. A sponge will absorb fluid, but it will release little of that fluid unless it is squeezed. Exercising the joint, in effect, squeezes the synovial “sponge,” allowing gas exchange to occur and nutrients to flow into the cartilage. Flexing and extending the joint alternately squeezes the sponge and releases it to reabsorb more fluid.